Can I just be really honest for a second! I really want to love this, I really DO! I love to doodle and I love to color but I have come to the conclusion that this book has pictures with such small areas to color that it is testing my patience a bit too far! There is so much detail to focus on and my husband will be the first to tell you that he is way better at attention to detail than me! I think these coloring books are great for people who want to color and can relax and do it without frustration and a perfectionist attitude. Unfortunately for me I am not relaxed and lack the patience for majority of these pages! I had to laugh because I showed this book to a friend and she quickly admitted the same thing... she hates the tiny spaces just like me. Maybe it's the fact that you have to have the best sharpened colored pencils or very fine tipped markers. 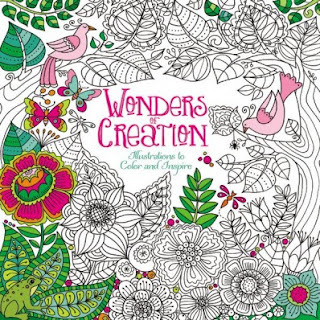 So if you have completed some of these detailed coloring pages please share them with me because I would love to see the beauty you created! SO PLEASE COMMENT A PICTURE! Thanks Zondervan for sending me this book in exchange for an honest review. I was not paid for this review and all opinions expressed are 100% mine!